Georgie Bush, our own beloved sociopathic Alfred E. Newman, has been seen sneaking out from whatever rock he’s been hiding under for the last two years several times in the last few weeks, a sighting that could mean only one thing: his ghost writers have finished authorizating his rememboirs. Last week, the book finally emerged onto bookstore shelves and boosted onto the best-seller lists by the right wing book buying machine. It comes as no surprise that George has no regrets about any policy decisions he’d made. The invasion of Iraq? Oh that was faulty intelligence–someone ELSE’s fault (which someone else, George Tenet, was awarded the Medal of Freedom for taking the fall for cooking the dumbass intelligence the way this dumbass president wanted). His main regrets appear to be public relations errors, Mission Accomplished (Great Job or something) and that stupid photograph of him looking out the airplane over sunken New Orleans. His worst moment? Kanye West calling him a racist. Because it forced a moment of self-reflection upon him? Au contraire–because it was so “disgusting” for Kanye West to say such a thing. Kanye has become used to apologizing for things, so naturally he has now apologized to Bush. And well he should have. Bush isn’t a racist–it’s poor people he doesn’t like. Poor people exist to be exploited–white, black, yellow, brown, red, doesn’t matter–he’s an equal opportunity exploiter. But what did we expect from Bush? Introspection? Precise delineation of how a person who rules from his gut came to gut decisions? 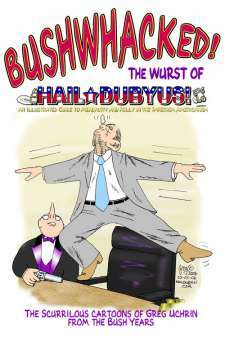 We chronicled the Bush years after 2003 in HAIL DUBYUS! 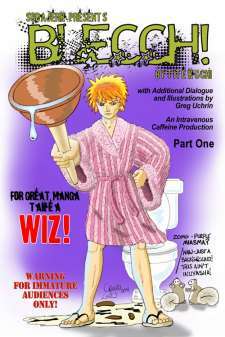 (when I finally decided to let loose my satiric skills–see my Best of Hail Dubyus and Best Of Page 2 pages) and in all that time, it was never clear whether Bush was an idiot, a lunatic, or just plain evil. His book does not elucidate that question any further. Most probably all three. 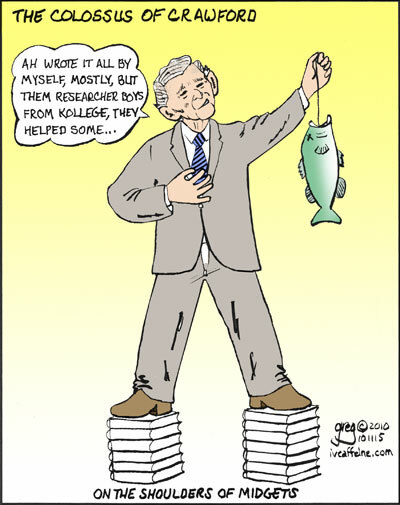 But his book does show a fourth side of Bush–a lazy sumbitch who wasn’t even content to let someone else write his memoirs, but had to plagiarize other books about him by his advisors. Just think of it–we got into two wars and a near depression (which may still become a depression if the deficit hawks have their way) because this man was too goddam lazy to think about alternatative strategeries. In other news, AnimeUSA was this past weekend and later this week, photos of cosplayers will be up on my Flickr account. So anyone that I took photos of, be sure to check that link on Thursday or Friday, by which the pics will be uploaded.